I think this substance was one of those accidental scientific discoveries. I loved it back then and I bet I would enjoy it today as well. Just a kid at heart. Super cool item. It could have been called "Flubber." After a while it would pick up so much dirt, ink, and crumbs that it became funky. I seem to remember that you could use Silly Putty to copy pictures from the newspaper, especially the comics. Just press the Silly Putty flat against the picture, let sit for a minute and then unpeel. 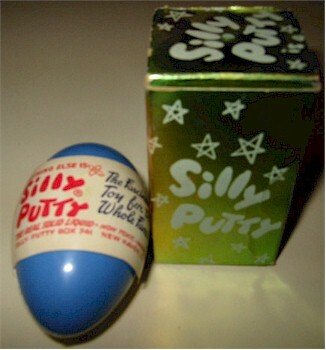 There would be a mirror-image of the picture on the Silly Putty. Every Friday night, our Dad would arrive home with a treat which he would buy after cashing his paycheck. One evening in 1959 it was two eggs of SPutty....my brother and I rolled it up and bounced it ONE time, after all, the ad showed it bouncing super high.....we never did find where it landed! !